Louisville, Kentucky — While homeowners are cutting back on entertainment expenses because of the struggling economy, they’re not cutting back on fun. They’ve turned to entertaining at home to cut costs while staying connected with friends and family. Converting outdoor areas into comfortable entertaining spaces is one item on many homeowners’ wish lists, as they see how the investment will add value to the home, save more time for leisure, and generate savings in the long run. According to a study by Kelton Research, more than 60 percent of women surveyed said they plan to spend more time with their families because of the current economic climate.¹ Among the 1,200 respondents, 62 percent said that they will dine out at night less often, and 62 percent said they will cook meals at home more often. “Whether it’s fueling the grill, warming the dining area, or eliminating bothersome pests, propane is the reliable, energy-efficient answer to many needs homeowners are trying to meet when creating outdoor living spaces,” said Paul Pearce of Pearce Bottled Gas. 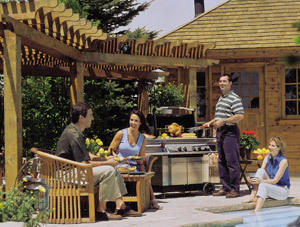 The grill is the center of a great outdoor entertaining space. Propane grills provide consistent, reliable heat for everything from simple burgers to gourmet creations. While grills are the gateway to an outdoor room, propane heat lamps and outdoor fireplaces create the warmth and ambience that help extend the use of these outdoor living spaces throughout the seasons. A permanent option for heating outdoor living spaces, propane fireplaces provide warmth and ambience perfect for relaxing, entertaining, or enjoying additional space where the family can gather at mealtime. Outdoor fireplaces are made of 100 percent stainless steel and can be surrounded by materials such as stone, granite, or tile. Propane table heaters, the most portable option for patio heating, use one- or two-pound disposable propane cylinders. Some can be connected to a larger refillable propane tank. The dome-shaped design of propane table heaters allow heat to radiate in all directions, generally warming a space 8 to 10 feet in diameter. To heat a larger area with maximum flexibility, consider a standing gas patio heater. These heaters are 6 to 7 feet tall and capped with a dome-shaped topper that directs heat downward 20 to 25 feet in all directions. A 20-pound propane tank is tucked into the base of the heater. Patio heaters can be made of stainless steel, painted steel, or cast aluminum. Unlike a wood-burning fire pit, propane heaters provide reliable, consistent warmth, burn clean, and don’t leave a mess behind. With a simple on-off switch, homeowners can use propane heaters to create enough warmth to extend the enjoyment of their outdoor living spaces from spring through fall. When it comes to energy-efficient lighting solutions, propane outdoor lighting fixtures and lamps are available in portable, wall-mounted, and post-mounted styles. For areas where insects can ruin a relaxing evening spent lounging by the pool or enjoying a twilight barbecue, a propane insect eliminator protects up to an acre of outdoor space. ¹ Kelton Research, “The Changing American Consumer,” February 2009. ² Opinion Research Corporation’s Caravan Omnibus Survey, conducted March 20–24, 2008.